You can easily create and add a new page to your Ning network as you create new content for your social network. To add new pages, you use the Ning Tab Manager. Click the Manage link on your network’s navigation bar. Click the Tab Manager option below the Your Network heading. 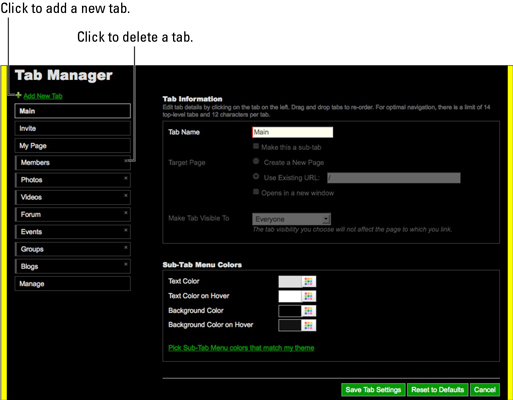 The Tab Manager page appears. Click the Add New Tab link at the top-left of the Tab Manager page. This adds a new tab (coincidentally labeled New Tab) right above the Manage tab. Enter a name for your tab in the Tab Name text box. Your network’s tab names can’t exceed 12 characters. Check the box next to Make This a Sub-Tab if you want the tab to appear only when members position their mouses over an existing tab. This setting creates the effect of a menu opening beneath the existing tab. The new tab is indented to the right in the list of tabs. Select the Create New Page option and click the Save Tab Settings button. The new page is added to your navigation based on where you placed the tab. Click the new tab in your navigation. You go to the newly created page. On the new page, click the Edit link to edit the page. Type or paste any content or code you may have at hand into the page’s text box. Allowable content includes plain text and HTML. Click the Update Page button when you’re done. This page is now part of your social network.